Hello, and welcome to this, the latest edition of Writer Writes a Journal Entry to Post Online. This time, we will see what happens when a writer writes a journal entry, then proceeds to post it online. You won’t want to miss the shocking conclusion. No drawings yet. Why? Well, there are a variety of excuses I could throw your way, but let us stick exclusively to the facts. One specific fact to which I’m stuck is that I’m still sick. This has put a major damper on my productivity for going on two weeks. Additionally, my search for a side job has officially kicked off, and applying for a few dozen jobs in a short period of time is time consuming and draining. The ‘draining’ aspect is really the more important of the two, for while I have the same twenty four hours as everyone else, my particular twenty four are fraught with illness and emotional exhaustion from filling out my employment history for the umpteenth time. But no need to focus on what I have not done, let us instead look at what is basically the coolest! My wife traipsed through my recently viewed items and gleaned from it something that I rather desired to own. Not only that, but she found it cheaper (and higher quality) than what I did. 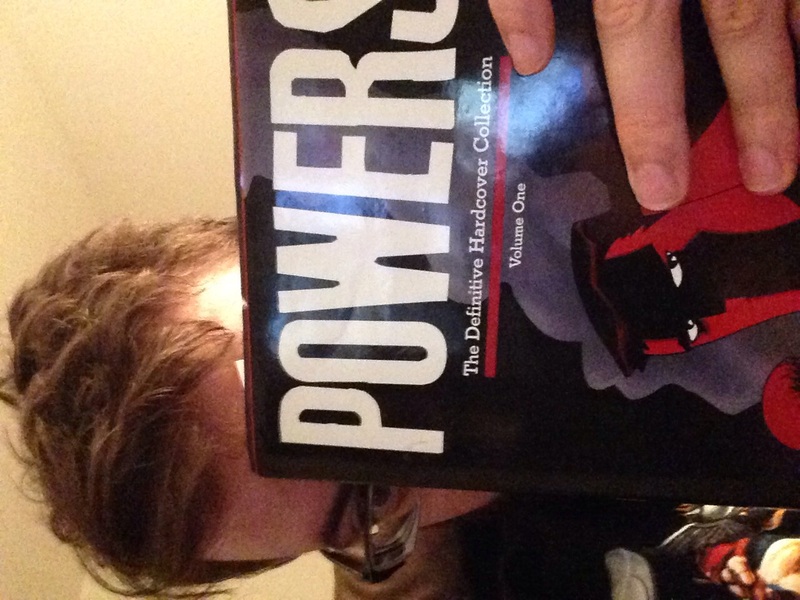 (She must be trained in the weirding ways…) That, dear reader, is how I now hold in my hands “POWERS:THE DEFINITIVE HARDCOVER COLLECTION, Volume 1”. This is a pretty cool comic, and one I hope to draw inspiration from. Assuming I hit my word goal… (checking… yes I did) that’s all for me. I’ll be back soon with some classy lines for you to criticize! I shall not belabor this point, as it seems unrelated to anything I am about to write. Even so, it’s worth noting. This is a quick post to let you all in on a little trade secret: actually working on anything is kind of hard. But there are still things to do, and many of them are necessary. For a few months, I have hinted at an art project that I plan to do, specifically involving my handmade art posting online. That project? Well, it’s on the back burner now, because I realized it needs more time to come to a boil, simmer, add more ingredients, bring back to a boil, and simmer longer. It will almost certainly come to be in one form or another, just not yet. Instead of that, I am adding an art project, specifically involving my handmade art posted online. What madness is this, you may ask? Well, person of indeterminate identity who sounds strikingly like myself, I can’t tell you yet. Or rather, I will not tell you yet. It’s an exciting collaborative project, though, and I look forward to giving further hints aas time passes. There is another side to this, however: I’m at best a passable artist. My art is grindingly barely good enough to communicate concepts. I need to get better. With that in mind, I’m putting myself through fake online art school. Will I work? Almost maybe! If people expect it to show up here with regularity, hopefully I’ll stay more on top of it. Expect a fair number of posts over the next several weeks. It should be interesting. Let me tell you a tale. A tale about a goat. More specifically, a tale about a simulation of a goat. Even more specifically, a tale about the studio that released a simulation of a goat. It will not be a true story. It will, in fact, be only loosely related to the facts of the matter. But I will tell you my truth. The truth in which I find hope, and perhaps a bit of inspiration. Once upon a time, a game development company, Coffee Stains Studio (this is truth so far, but from here on out I’m making it up) became so fed up with the established video game industry that they rebelled. No, what the world needs is… something random. They defied their peers, those who scoffed, “You can’t make a game about goats!” The scoffing served only to press them forward. From this righteous effort came forth… well, Goat Simulator. I’m trying to build up that grit-and-bear-it attitude for my fiction projects again. And if you’re wondering why I’m talking about Goat Simulator, it’s because Skittles made a deal to make it free today. So, thanks, Skittles!